Private Car Trip Added! Midwest Rail Rangers Goes Hollywood… Hollywood Beach, that is! Spring and Summer 2019 will no doubt be an extremely busy time for the Midwest Rail Rangers… and we are hoping that you will join us for one of our MANY events scheduled for the months ahead. 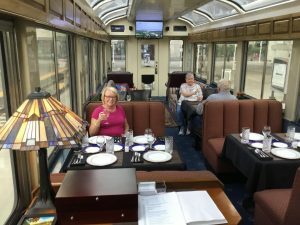 Hopefully you saw the special “Private Car Alert” message sent out last week… but in case you missed it… the Midwest Rail Rangers is partnering with Keith White, the owner of private car “Hollywood Beach”, in hopes of running a special private rail excursion this summer between Chicago and Southern Illinois. The round-trip-in-a-day between Chicago and Carbondale, Illinois is scheduled to take place on Saturday, June 8, 2019. 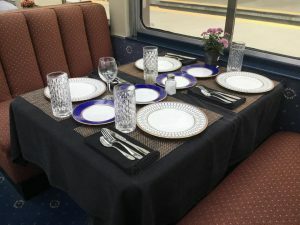 Ride more than 600 miles round-trip through the beautiful farm country of Central Illinois on this beautiful private car — offering stunning views of the countryside and towns that grew up along the Illinois Central. This is really a “MUST DO” once-in-a-lifetime trip. This is the first time in nearly 5 years that the Midwest Rail Rangers is offering narration on this train line. Depart Chicago at 8:15a, Arrive Carbondale at 1:45p, re-board by 4pm, and arrive back in Chicago around 9:45p. Tickets are just $298 per person. Want something extra special? How about spending the night before the trip and/or the night after the trip in the Chicago Yards? That’s right — sleep in one of the bedrooms of Hollywood Beach and don’t worry about getting into Downtown Chicago in time for the trip on Saturday morning — and/or — don’t fight the busy Saturday night traffic. A bedroom on the car, which will be parked in the Amtrak Yards, is just $250 per person based on double occupancy. 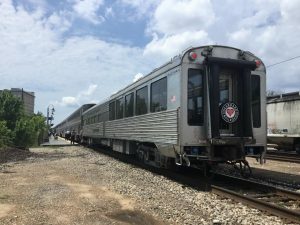 In order to make the day trip to Carbondale financially profitable, we must sell spots in the bedrooms too… so please consider supporting this trip, having the rare experience of sleeping in the train yards in Chicago — it’s something you will not soon forget watching all of the train activity aboard. IN ORDER TO GET THE SPECIAL PRICES QUOTED ABOVE — YOU MUST MENTION “MIDWEST RAIL RANGERS” when booking. To reserve your spot, or for more information, please e-mail: onecniccat@prodigy.net. The Midwest Rail Rangers will also be busy with our special on-board educational programs on the South Shore Line this Spring and Summer season, too! Join us two to three weekends per month for a round-trip ride on the South Shore Line between Chicago and South Bend to learn about all of the interesting landmarks along the way. 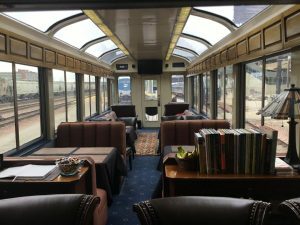 The train passes through or very close to two units of the National Park Service — including Pullman National Monument and Indiana Dunes National Park — plus two other affiliated NPS units and four state park locations. Our guides will tell you about he people, places, and history that you are seeing out the window. Makes plans to join us — we have all of our dates through the end of August 2019 up on our website now. We also hope you will join us for one of our four upcoming special presentations at local libraries during the months of April and May. We gear our on-board educational programs on the South Shore Line to the average rider who might not care about railroad history as much as others. So, we don’t have much time to talk to people about the interesting relationship the South Shore has had with Chicago and Northwest Indiana since its creation in 1903. 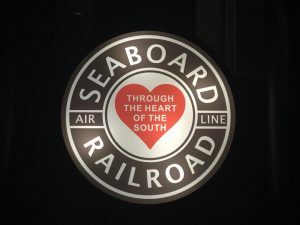 However, we have had special requests from several riders to know more about the history of the South Shore — America’s Last Interurban Railroad. In order to satisfy the curiosity — we have partnered with four local libraries and will be giving one hour long Power Point Presentations about the history of the South Shore Line from its creation more than 110 years ago… to modern times. Come out to Chicago’s Hegewisch Neighborhood, New Carlisle, Michigan City, or Merrillville and join us. Dates, times, and location information is also up on our website. I’ll wrap up this chat with you with a special THANK YOU (on behalf of our Board of Directors) to the handful of individuals who have opened up their wallets in recent weeks to give a donation to the Midwest Rail Rangers. As you probably know, we were part of the APRHF (American Passenger Rail Heritage Foundation) for many years… however… given various circumstances… realized it was in our best interest to break away and become our own independent 501(c)(3) organization. We got the official approval from the IRS in March 2019… who “back-dated” our start date to December 17, 2018. We are very proud of what the future will bring for our organization… but… we are starting out with essentially no money in our bank accounts and are hoping to build up a nice reserve so we can continue to bring you on-board educational programs for years to come. A lot of riders who enjoy our programs do not realize the cost involved in what we do. Insurance alone to do our programs on the South Shore Line costs several hundred dollars per year… and there is upkeep that must be done on our speaker systems… and research costs, etc. Thank you to those who have cared to show their support by donation. If you have not, would you consider even a small donation to help us get a good footing for the future? We have a donation button on our homepage — railrangers.org — and remember, everything is tax deductible with us being a 501(c)(3) non-profit. Your purchase of railroad route guides at MidwestRails.com also helps support our group. Choose from books, e-books, or our brand new podcasts.